Since 1987 the Community Miracles Center has been producing a monthly publication which is directly mailed to A Course In Miracles students all throughout the world. This publication contains inspirational and truly healing articles. CMC co-founder, Rev. Tony Ponticello frequently writes articles along with other CMC minister and many guest authors. Miracles Monthly is known for publishing diverse and sometimes controversial viewpoints from all segments of the greater ACIM community. Miracles Monthly is not "shy" about strong opinions and divergent editorial comment. 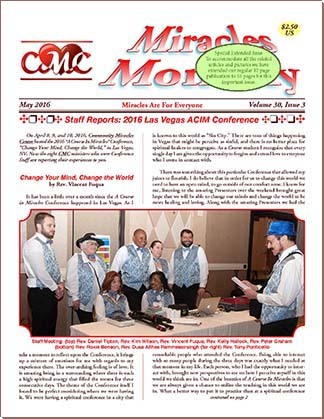 It also contains news about important ACIM events and other significant developments within the greater ACIM community. In 2007 Miracles Monthly evolved into a full color twelve page publication available by subscription only. CMC Supporting Members receive a complementary subscription as a benefit of their membership. To subscribe to Miracles Monthly fill out the following secure web form: Subscribe Miracles Monthly. © copyright 2016, Community Miracles Center, San Francisco, CA. All rights reserved.